This week I visited Balazs' layout and we made quite some progress on adding industry tracks, sidings, and conceptualizing how running an operating session on his new layout would work. 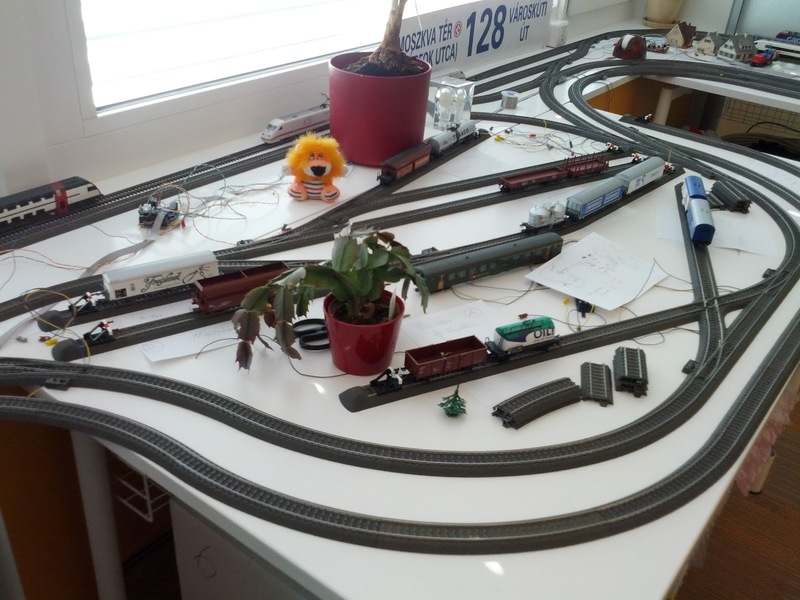 This tabletop layout does support fully automated running, too, so the objective was to add enough operational opportunities to keep a few operators busy and entertained when running the layout in manual mode. During automated operation, the layout is treated as a mostly double-tracked loop, with two single track choke points and one large interlocking that allows trains to run return loops, or take short-cuts. For manual operation, I modified the concept and think of the layout as a single track mainline with sidings. The sidings give operators switching an industry track space to hold cars being switched, as well as a logical hiding place to not block main line traffic. For each industry track I defined what kind of car type the track would accept. I chose a distribution of car types that roughly matches the fleet Balaszs has. Due to space constraints, most "industries" are single or double track spurs, mostly off sidings. There is one large industry with a more complex track arrangement. To create a feeling of location, I gave each industry a name, as well as town names (well, the town names are not exactly imaginative: A, B, C, D, E, and F arranged roughly clockwise along the loop of track). Once that was worked out I placed sheets of paper near the tracks indicating location, industry, and what kind of cars the track would accept. A small, stub-ended classification yard existed already. We added a dedicated track to be used as yard lead to disentangle the lead from the single A/D track. Now that we had industry locations and respective tracks, it was time to define trains. There are almost 30 car spots, maximum train length is about 8 cars, and multiple operators are expected to work the railroad. There will be local freights, through freights, as well as extensive passenger operation. I broke up the local freight operations into 3 trains. One would run from the Yard to towns A and B, one would cover towns C, E, and F, and finally there would be a dedicated run to switch the large industry in D.
To extend the length of the runs, and make the job of a dispatcher a bit more interesting, the local freights need to go all the way around the layout between switching two towns. 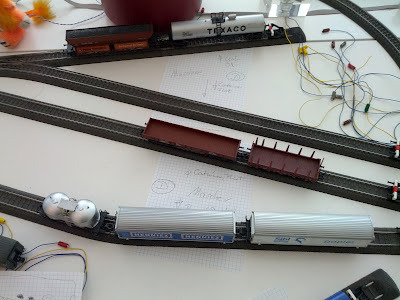 All trains are turns, so the engineers need to pay attention to trailing and facing point turnouts in the industries to switch, and in the worst case run around their train on a siding as needed. 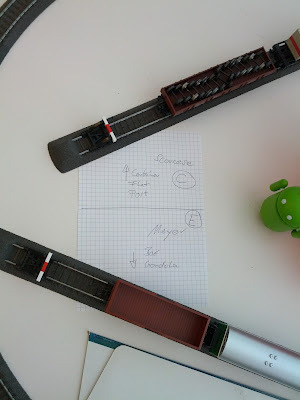 For each train I wrote station/loop order on a sheet of paper, so that the operators know what's expected of them. Car routing works by type of car. If a track asks for a box car, any box car the train brought along from the yard will do. The engineer is expected to keep track which cars he picked up at an industry on the way and make sure to bring them back to the yard. However, even if a car or two slips through, it doesn't really matter that much. This operating scheme was developed over the course of about an hour, and we ran a session with all 3 local trains, plus classification in the yard the same evening. There's certainly room for improvement and fine-tuning. However, for something that was made up on the fly, I was pleased to see that it worked well enough to give a feel for how switching on the layout could work, as well as quickly identify areas both on the layout and operationally that need further refinement before investing a large amount of preparation time. Plus, we certainly had fun, both building out industries and track arrangements, as well as operating ... In the end, this is a hobby. Enjoying what you do is the only thing that matters.